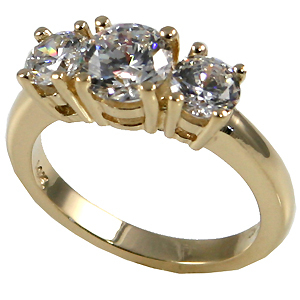 14k Gold 3 Stone CZ/Cubic Zirconia Anniversary Ring - SOLID HEAVY! Stock #S103:14k Yellow and 14k White Gold traditional Style, 3 stone- Anniversary (past, present, future) heavy ring.. 2 Carat TW Russian Cubic Zirconia's (1 ct center, 2- 1/2 ct side stones).Gorgeous, Top Quality Rings, Russian CZs!!! Nice traditional style ring. Also available in 1, 2, and 3 carat total weight. Heavy Weight Version! This item is made-to-order, Just for you, and takes 3-7 days.